Do you live in Inverness? Inverness is a city in Citrus County, Florida, United States. 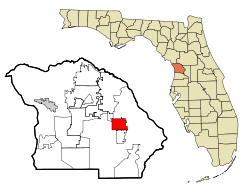 As of the 2010 census, the population was 7,210.It is the county seat of Citrus County and is home to the Citrus County Courthouse and near the 10,950-acre (4,430 ha) Flying Eagle Preserve. The city of Inverness was originally named "Tompkinsville". Settlement of the area dates back to 1868.A. D. Tompkins, later known as "Uncle Alf", started the community. To attract newcomers to the town, he established mail service and helped erect the first sawmill in the county. He gave his brother-in-law, Frank M. Dampier, Sr., a lot to build a store, with Dampier becoming the first merchant in town. Dampier is credited with laying out the town and naming it Tompkinsville. Not many years later, the town of Tompkinsville was sold to a firm in Jacksonville, and the name was changed to "Inverness". According to the late historian Mary McRae of Homosassa, Inverness got its name from a lonely Scotsman, far away from his home, who gazed upon the blue waters of the Native American-named Tsala Apopka Lake and thought the area looked like the headlands and lochs of Inverness in Scotland. Inver is a Gaelic word meaning "mouth of the river", and through the Scottish city flows the River Ness, originating from Loch Ness. Since the Florida city lies at the foot of one of the chain of lakes in Citrus County, Inverness seemed an appropriate name. Per official city documentation, Inverness was incorporated on March 6, 1917. Over twelve downtown buildings have been recognized by the historic plaque program and are presently active places for business. Central Business Development grants have helped to retain the historic character of the city. In 1961 the historic courthouse downtown was used to film the courtroom scene of "Follow That Dream" featuring Elvis Presley. The city has been designated a "Gateway Community" by the Florida Trail Association. Since 1995, Inverness has been recognized as aTree City USA by the National Arbor Day Foundation and the US Forest Service. In 2009, Inverness was named "City of the Year" by theForty and Eight, a national veterans' organization. As of the census of 2000, there were 6,789 people, 3,190 households, and 1,805 families residing in the city. The population density was 931.7 people per square mile (359.6/km²). There were 3,635 housing units at an average density of 498.9 per square mile (192.5/km²). The racial makeup of the city was 91.83% White (non-Hispanic), 5.20% African American, 0.38% Native American, 0.57% Asian, 0.06% Pacific Islander, 0.77% from other races, and 1.19% from two or more races. Hispanic or Latino of any race were 4.42% of the population. As of the census of 2010, the racial makeup of the city was 92.93% White (non-Hispanic), 4.10% African American, 0.38% Native American, 0.54% Asian, 1.46% Pacific Islander, 0.77% from other races, and 1.19% from two or more races. Hispanic or Latino of any race were 3.05% of the population. There were 3,190 households out of which 18.0% had children under the age of 18 living with them, 43.2% were married couples living together, 10.3% had a female householder with no husband present, and 43.4% were non-families. 38.8% of all households were made up of individuals and 24.3% had someone living alone who was 65 years of age or older. The average household size was 1.99 and the average family size was 2.60. In the city the population was spread out with 16.6% under the age of 18, 4.9% from 18 to 24, 19.3% from 25 to 44, 21.2% from 45 to 64, and 38.0% who were 65 years of age or older. The median age was 55 years. For every 100 females there were 76.4 males. For every 100 females age 18 and over, there were 72.0 males. The median income for a household in the city was $26,604, and the median income for a family was $35,342. Males had a median income of $27,255 versus $21,052 for females. The per capita income for the city was $17,211. About 9.6% of families and 14.8% of the population were below the poverty line, including 27.5% of those under age 18 and 8.3% of those age 65 or over.